The fruit of two days worth of labours! I made this cake for my boyfriend's brother's 18th last week. It was one of my more interesting challenges so far, although overall relatively simple, there were some tricky bits along the way! I used new ways to get the best results, and I started experimenting with sweets for decorations, and adornments etc. The console was created from, what started out as two 9" by 6", 3" high rectangular sponges. Each sponge had the top carefully levelled using a large bread knife before I started, and then I sandwhiched the two together with some icing. 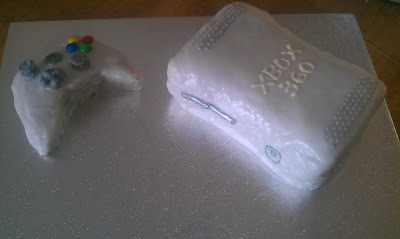 I used white fudge icing to both sandwhich together the cake, crumb-coat the console and to coat the controller. This created a very slightly off white coloured icing, which was suitable for this cake. It was made using the following recipe. Sieve the sugar into a large bowl and set aside. Heat the syrup, milk and shortening in a saucepan until the fat has melted and the mixture is almost boiling. Remove from the heat, add the vanilla essence then stir into the sugar beating with a wooden spoon. Leave to sit until it reaches the desired consistency (it will get thicker as it is left). Once I had a nice smooth-topped tiered cake, I trimmed off all four edges to get a rectangular shape, at 0.6:1 scale of compared to a full size xbox. I cut neat straight edges to give a perfect rectangle from which to work. I marked the middle of the front and began by cutting the front arc from centre out to approx 2 inches from the left and right sides (my new icing turntable came in sooooo handy for all this cutting!). Then I repeated this at the back to match, but making the indent slightly shallower than at the front. I then marked across the top of the cake from front to back, the central line, to again create a curved indent to look like an xbox. Ocne I was satisfied that the shape of all this looked right, I proceeded to round off all of the relevant edges, to create the bevelled edge type look that the xbox console has. Once I was satisfied that I had the correct shape I used the white fudge icing to coat the cake twice to seal in all crumbs etc. I then covered the cake with a thin layer of rolled out white fondant icing. The remaining details mostly involved some melted white chocolate which was put into a small decorating bottle. I drew the cd tray onto some baking paper, with white chocolate. Once this had dried I used a craft knife to neaten up the edges and gently scrape in lettering and detailing (the eject button etc) and then used the edible silver glitter to cover the piece of which chocolate and turn it silver. The power button was drawn on using a green edible felt tip pen. 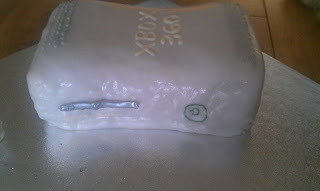 and the XBOX lettering and cooling holes on the top of the cake were drawn on with white chocolate also. In the case of the cooling holes, I added silver edible glitter to the chocolate to make it grey. 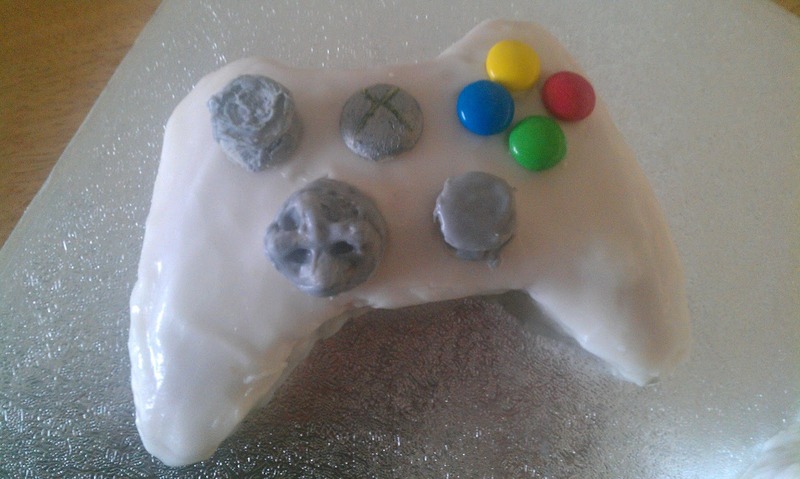 The controller was made by drawing around my boyfriend's x-box controller onto a sheet of baking paper. I then free drew a smaller version inside that line following the original shapes and curves, but creating a smaller template. I placed this on top of a 6" round vanilla sponge and cut out the basic shape. Each edge was then rounded with some gentle trimming of the caketo give a more accurate, curved look. I placed the cake onto some baking paper and coated the control in 3 layers of white fudge icing (see recipe above) allowing each coat to dry in between applications. (I had some melty, subsided bits when I needed to move the control into its final resting place, but happily this came away with the baking paper nicely). I puzzled over how to make the various buttons for a while, not knowing what I was going to do, and I had almost settled for something inaccurate when, my boyfriend returned from the shop run I sent him on, with white chocolate buttons.... as far as this cake is concerned, they are the most amazing sweet EVER. I got my sweeties to hand (white chocolate buttons and m&m's) and melted up some white chocolate cake coating, which I then put into a decorating bottle with a small nozzle. It turns out this cools and sets really quickly, and unless you want some extra exercise jumping up and down and going to the microwave every minute or two, I would recommend having a mug filled with hot water to stand your bottle in, or similar to keep it warm, and some kitchen paper ready to wipe off any water on the outside of the bottle. I didnt learn this until about my 15th trip to the microwave, apparently I have a primitive method of learning how to make my life easier. The central buttons ... the middle top, with the x on it. I used the largest white button I could find in the packet. I then took some silver edible cake glitter, and mixed it with some vegetable shortening to form a sparkly silver paste (you probably dont need to do this, with enough glitter alone im sure it would work, but I wanted to get it really bright and use the glittter as more of a paint). I painted the mixture onto my big button, then drew the stylised x logo on with a green edible felt tip pen (these are awesome! Soooo easy to use! I found these online a couple of weeks ago, but noticed them in the cake decorating section of my favourite shop, so that seemed like a lovely easy way to get a small detail onto my cake!) et voila, one big silvery button. The two rotating pads, top left and bottom right, were a tricky one. Oh did I wonder how I would do those! However the world was a good place, as I threw my chocolate buttons onto a plate, one landed upright with a second landing upside down on top of it, and I'll be damned if it didn't make a great looking controller stick! All I needed was a way to turn them grey. I got some of my melted white chocolate coating, and added some of my silver edible glitter, this turned the mixture grey, I played with the quantities until I got the right colour, then painted the 4 required chocolate buttons to make the sticks. Once this had dried, they were stuck together with the rounded ends facing together, then added to the controller. The arrow pad, was one chocolate button, which I enlarged with extra white chocolate, and then painted a cross shape over . Once this was the right shape, I used what was left of the grey chocolate and painted the whole thing grey. This is much more my kind of xbox than the normal kind I gotta say!